After months of research into the existence of Thelema and A.’.A.’. 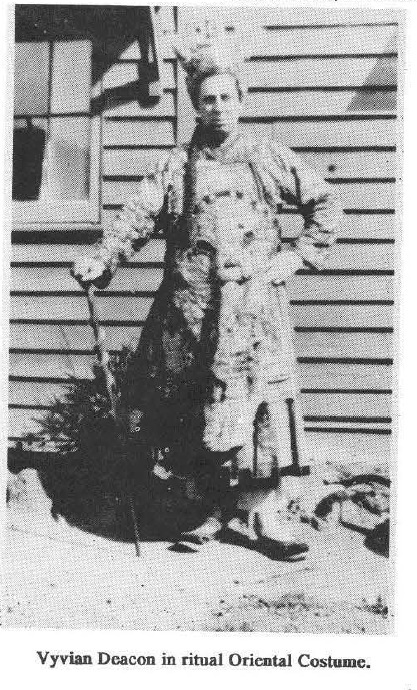 ( respectively the religious framework and magical system devised by Aleister Crowley) in New Zealand before world war 2, we are going to present the (scant) information we have accumulated here with a general appeal to any one who may stumble across this who has any further information to please leave a comment on this post. 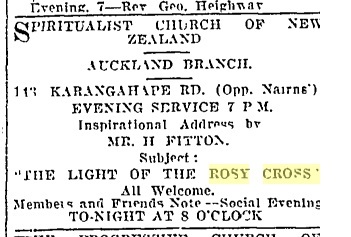 The most concrete evidence we have for the the teaching/practice of Thelema during the years covered comes in controversial figure of Vyvian (sometimes Vivian) Deacon Australian spiritualist who came to New Zealand in the early 20’s speaking on spiritualist matters and apparently spreading a movement known as “the Christian Mystics of the Rose Cross” a name which obviously links it to Rosicrucianism but according to his daughter a front for Thelema. (that he had a connection with Crowley is well attested despite the muddiness surrounding his induction into the O.T.O (Crowley’s magical order)). when he went to New Zealand. My mother found my father eventua! 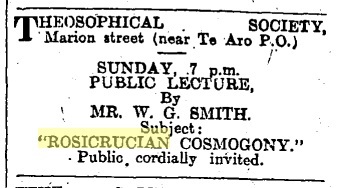 before moving on to Wellington and an association with “the church universal” giving a series of lectures (which resulted in the reporting of some reasonably detailed outlines of the talks) as well as some Independent lectures at the “Esperanto Hall” directly addressing Rosicrucianism. 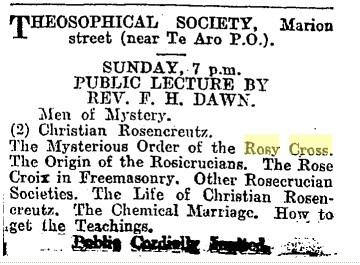 If anyone has any information at all about “the Christian Mystics of the Rosy Cross” (especially), the “spiritualists church worchester st west” or “the church universal” in Wellington, Please leave a comment. The other (slightly less) promising lead is that of Clement Wragge esoteric archaeologist (amongest many other things). his archaeopedia.com entry contains the following exciting though poorly sourced entry. Wragge was also a leading spiritualist, describing himself in 1921 as “Minister of the Auckland Spritual Scientists Church” and refering to both theosophy and A.’.A.’. 8. ↑ MS My Life, Auckland Institute and Museum Library. no manuscript by this title turns up in the Auckland Museum Institute’s records, though if this means that it has been lost, or not recorded when they digitised their records, or it never existed, or if archaropedia got the title of the manuscript wrong is not clear. Eventful Life’ by Clement Wragge. If anyone has any information that can throw any light on this please leave a comment. Though there are a few references to Crowley in the New Zealand press this is the only one obviously aimed at New Zealanders (though despite the claim it was specifically written for the press it seems to be an adaptation of an Australian review with the references to Australia edited out). *With thanks to the National Library of New Zealand. This entry was posted in Ritual Magic and tagged A.'.A. '., Aleister Crowley, Christchurch, Magic, Medium, NZ, O.T.O, Rumour, Thelema, Vyvian deacon, Wellington, Wragge. Bookmark the permalink.